IN STORE PICKUP ONLY!!! 2006 Oppenheim Toy Portfolio Gold Seal Award Winner! 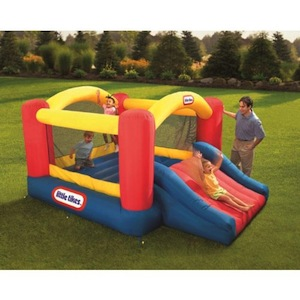 When it comes to large toys, the Little Tikes inflatable bouncer and slide equals big fun! Huge inflatable gym measures 9 x 12 x 6 feet. Inside dimensions measure 7 x 6 feet. Tall protective walls surround a large jumping area, including a big slide with protective side rails. Mesh door features hook-and-loop closures to protect children, and allow you to watch the fun. Stakes anchor the inflatable bouncer firmly in place, while a heavy-duty blower provides continuous airflow. Built of puncture-resistant material. Includes stakes, heavy-duty blower, repair kit and storage bag. Inflates in under a minute! Weight limit 250 lbs, no more than 3 children at a time. Must use on a soft play surface. Ideal for ages 3 to 8 years. For outdoor home backyard use only. 90 Day Limited Warranty.